PetitPoix: US$30.00 Prize Winner Announced! 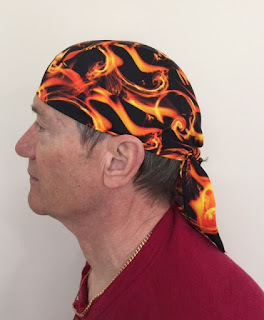 The durag drafted and sewn by Ann M.
Model: Her Husband, Bill M.
The 2015 PetitPoix contest has come to a close and the winners this year were the animals! While disappointingly there were no participants in the creative competitions, one home-based designer Ann M. sent us pictures of a durag she made with a pattern she drafted herself using our online patternmaking tutorial, How to Make a Doo Rag Pattern. Ann had no idea there was even a contest taking place. However since she is the winner by default, She has won free publicity to the charity of her choice SPCA International, a global animal rescue. As for the random drawing, we are happy to announce that animals are the winners again! Coincidentally, one of the partners in a shop called Loving Misfits on Etsy had purchased the durag pattern to participate in a fundraiser for foster dogs and cats. Loving Misfits is a 501c3 corporation, all profits from the shop's sales go to buy wish list items for animal rescues and shelters. Instead of keeping the money for herself, the random drawing winner chose to donate all of it to the cause. Watch the video below to see the random drawing as it happened!